Chayton Winston is a veterinarian. He is also a werewolf. Much to his Native American parents chagrin, he has always dreamed of a fair-haired, Caucasian mate. However, he never imagined his mate would be male. As a heterosexual man, he's not quite sure what to do with a male mate, but more than willing to find out. Keaton Reynolds wakes up, in wolf form, and finds himself with a mate. He's instantly attracted, but not so thrilled to find out the man is straight. Having been in a relationship once before where his partner professed to be "Not gay" left a bad taste in his mouth. Keaton wants to make a break for it and pretend he never set eyes on Chay—but Chay is not ready to let him go. Together the two work to solidify their shaky relationship and battle the prejudices against homosexuals. Chay must deal with not only his mother's prejudices against gay men but also her hatred of white people. When a power struggle in Keaton's pack threatens Keaton's life, the two men learn to depend on one another and their relationship to get them through it. 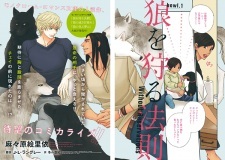 Ookami wo Karu Housoku is based on J. L. Langley's novel, Without Reservations.